The Superman Squad then leave Superman in Lincoln, Nebraska, in the present, where Superman will have an encounter with a woman who will be inspired by his heroic actions. 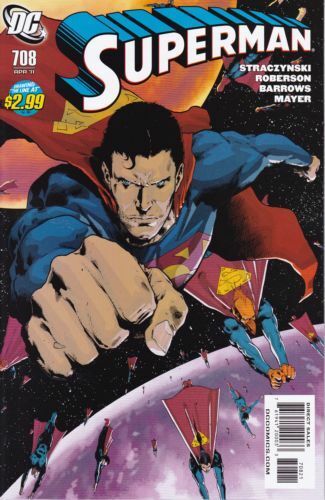 Superman then flies to Lincoln, where a devastating storm is happening. Superman saves a school bus full of children, as he is being watched by Wonder Woman. Then, Superman notices that the storm is creating a flood. Also, a tornado is coming to town, forcing Superman to choose between stopping the tornado or saving the people from the flood. Fortunately, Diana appears and Superman asks her to save the people while he goes to stop the tornado. Although confused, Diana agrees. Superman uses a powerful clap to create a supersonic boom that dissipates the tornado. Meanwhile, Diana puts the people in rooftops to protect them from the flood. Suddenly, she is attacked by Lisa Jennings, who claims she ruined everything. According to Jennings, Superman was supposed to make a difficult choice: sacrifice a few to save the many. However, Diana interfered and Superman was never forced to choose. Just as Jennings is about to attack, Diana punches her and prepares for battle. However, Jennings reminds her that there is still people at risk. Diana is forced to let Jennings go to save more people. After the people is safe, Superman thanks Diana for helping him. Although Diana admits she wasn't here to help since she is on a quest for vengeance, she was inspired by him to act like a hero. Diana then flies away, but not before warning Superman of a woman in black. Superman thinks that the woman in black may be the one she saw on his dream on Chicago. However, Superman puts those feelings aside so that he can help the panicked citizens. He is watched by Jennings, who says that Superman's descent is only beginning.